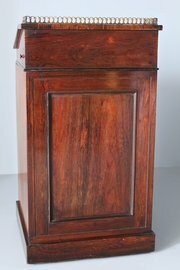 DescriptionThe restrained, clean lines of the Regency period can be seen in this rosewood Davenport of the early 19th century. 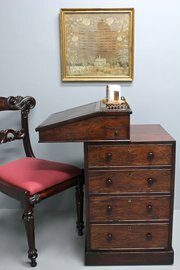 The writing section sits on a bank of 4 drawers, fixed to it but pivotting to the side to allow the use of a chair. The sloping lid with a tooled leather opens to reveal a drawer-fitted interior. 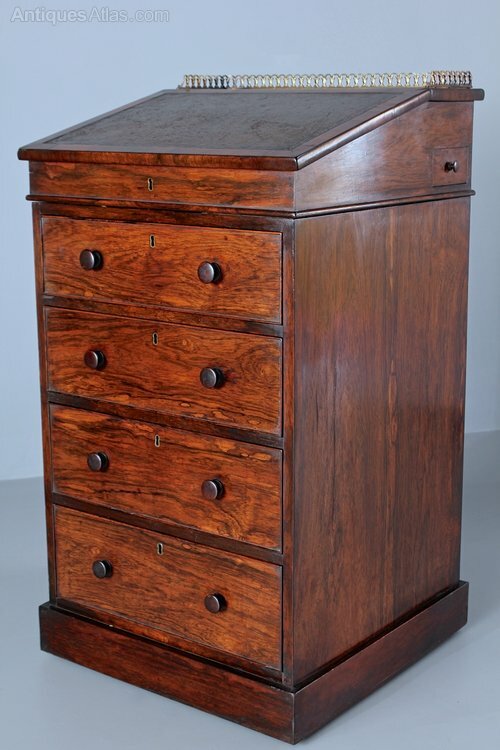 To the right side is a concealed pen and ink drawer that, once withdrawn, hinges neatly to the side. A brass gallery completes the top. The base has a panelled back, and original small wooden handles and brass escutcheons. Beneath the base plinth are concealed original castors. 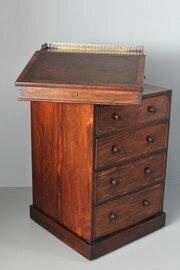 A fine and elegant writing desk. Circa 1820.